Definition: The Encirclement Attack is a war strategy adopted by the challenger firm intended to attack the competitor on all the major fronts. Under this strategy, the challenging firm considers both the strengths and weaknesses of the opponent and then launch the attack simultaneously. It is assumed that only those firms that are 10 times stronger or powerful than the opponent firm can launch the encirclement attack. The attacking firm must be adequate in its resources, then only it will be able to launch a grand offensive on several fronts. 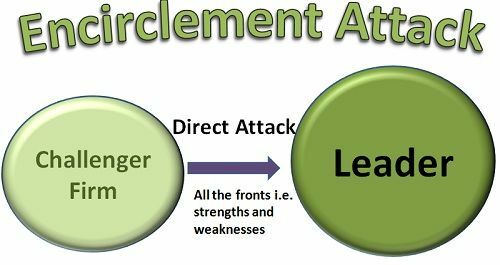 The two strategies that can be used under the encirclement attack are Product and Market Encirclement. In product encirclement, the challenger firm may introduce different types of products with varied features and quality and may price these differently on the basis of their utility. In the case of market encirclement, the firm may introduce the product for such a market segment, which left untapped by the competitor and thus enjoys the huge market share. The e-commerce industry is the best example of an encirclement attack, wherein the companies are ready to do anything for the huge turnovers and are even selling their products at negative margins. The fashion Industry is the another example, where companies frequently launch the different variants of products priced differently, in order to have a huge sales turnover and supersede the competitors.